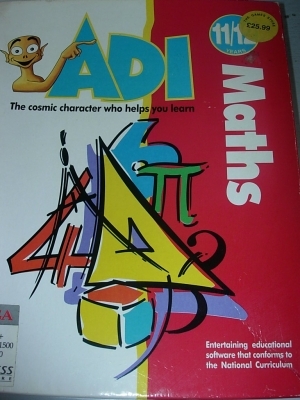 Home/Computers/Amiga/Amiga Games/ADI Maths 11/12 Years. 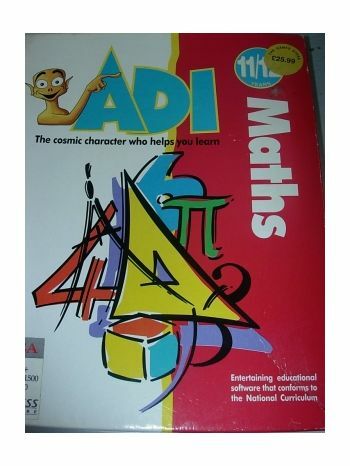 ADI Maths 11/12 has been created for pupils in the first year of their senior education. It uses the fascinating theme of the Seven Wonders of the World to present a set of progressive exercises that will guarantee the pupil's active involvement. Each Wonder opens up into sub-chapters to explore:-* Numbers ( techniques of calculation, proportions, number operations and percentages) * Mental Calculations (addition, subtraction, multiplication, division and series operations.) * Shape and Space (perimeter, area and volume) * Simple Figures (triangles, quadrilaterals, and geometric constructions) * Symmetry (line and rotational symmetry) * Algebra (simple equations and functions) * Statistics (mean, bar charts and pie charts) Conforms to the National Curriculum. OPERATES ON AMIGA 500, 500+, 600, 1000, 1500, 2000, 3000 Manual included.